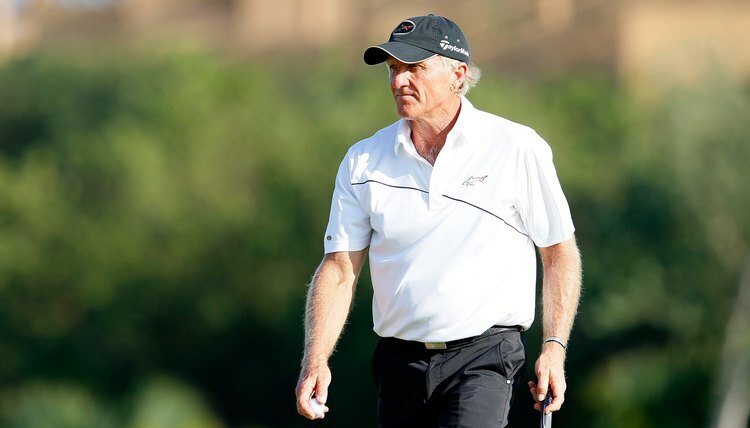 Greg Norman says resistance training will improve your swing. Resistance training is another name for strength training using weights or other devices. It may take the form of free weights, weight machines, elastic bands, dumbbells or your own body weight. Professional golfers have club-head speeds in excess of 100 mph, and even slow swingers generate club head speed of 50 mph, putting tremendous strain on various parts of the body. Resistance training strengthens your muscles, protecting your body and enabling it to cope with the strain. Your increased strength can improve your club head speed and increase your distance and control while mitigating the potential for injury. Select a workout plan, such as the one detailed on PGA veteran Greg Norman's website. Norman, who was devoted to fitness before it became a standard element of a professional golfer's routine, recommends a resistance workout plan that he says worked wonders for many regular golfers. Another resistance plan from Sports Fitness Advisors emphasizes explosive power combining strength and speed, both of which enable you to ratchet up club-head speed without overswinging. A third plan, described in the Journal of the Canadian Chiropractic Association, focuses on preventing injuries and increasing the overall fitness and swing speed of recreational golfers. Work out according to the plan you have chosen. Norman recommends a plan using weight machines in the gym or free weights at home. Perform 12 to 14 resistance exercises on the machines three times per week. The entire routine takes 25 to 35 minutes. Specific exercises, such as leg curls, presses and extensions, as well as abdominal curls, bicep curls, lower back exercises and triceps extensions, correspond to strengthening specific muscles used in the golf swing. Use an off-season strengthening program, as described by the Sports Fitness Advisor plan, starting with very light weights and building up to more strenuous exercises that include push-ups, crunches, dumbbell lunges and curls and back extensions on a stationary ball. This plan also focuses on explosive power with exercises such as plyometric push-ups in order to enable you to swing with strength and speed. Work on your spinal stability with the Canadian Chiropractic program to prevent lower back injuries. Do exercises such as curl-ups, bird dogs, side bridges and front supports. Strengthen the shoulder area with lower trapeze arm raises, standing shoulder external rotations and more. Move to the strength and power phase that is similar to the Sports Fitness Advisor program. High force and high speed elements of this portion include power cleans or clean and jerk, seated rows, cable pulls and plyometric medicine ball tosses. Add stretches to the routine. Norman writes that stretching enables your muscles to relax and lengthen. This increases your range of motion and joint flexibility. As you continue resistance exercises and stretching, you will generate more power with less effort. Chart your progress. Norman says one group of golfers who followed the program he recommends increased their club head speed by 2.6 mph with just resistance training and doubled that number to 5.2 mph with the addition of stretching. On average, the golfers lost four pounds of fat and gained four pounds of muscle. Overall joint flexibility increased by 30 percent, allowing golfers to swing with more mobility and lessen their chance of injury.